We've had some family round this weekend! On Saturday Kate and Dave came over to see us and meet Tom, and on Sunday Jenny & Ash called in. I didn't manage to get many photos this time round (think I'm still in a bit of a daze, it didn't register to get the camera out) but Mark did manage to snap a couple. Jack was a bit overwhelmed with the guests. It took him ages to come out of his shell and play when Kate & Dave were over, very much out of character for Jack! Mind you, a belly full of food and a new wheel barrow complete with gardening tool set warmed him up! He wasn't much better on Sunday, but I think he was starting to get used to having so many people round and (again with the help of some food) he did relax after a bit. Today's been pretty busy too. 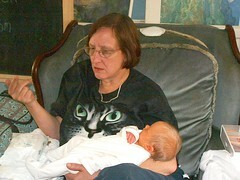 The midwife came over this morning to do Tom's 5 day checks and his heel pricks. Poor wee Tom, screamed his little head off! Jack came charging over with a "What are you doing to my brother?" expression on his face, and he laid a protective hand on Tom until I reassured him that it was all ok, and he could go and play with daddy. The out come being that both Tom and I appear to be fit and well. Tom was weighed and has only lost just over 2 oz (which is great, Jack lost 13 oz in his first week and even that was considered not to be a worry given his size). 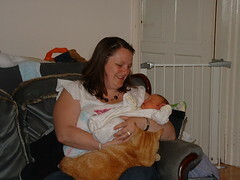 My mum came over for the afternoon too with John, who hadn't met Tom yet. They took Jack to Morecambe for lunch and a mad hour or two at Happy Mount Park while we went into town to get Tom registered and pick up a passport form for him. We'd planned to get to the bank and open an account for Tom too, but since the car battery is flat AGAIN (for no apparent reason this time) and we had to walk we ran out of time. But since daddy has been offered a few more days work again this week (whoohoo!) I might just potter in to town with the pair of them through the week and get it sorted - it'll give me a chance to start looking at Fathers Day presents, and a birthday present for Nana (aka my mum) too.